From the introduction to the final page, Threaten to Undo Us is an intense and fast-moving historical novel. Even though the story covers several decades, the author seamlessly connects time lapses and points of view without interfering with the storyline. In the introduction, we see Stalin, Churchill and Roosevelt discussing the redrawing of Poland after World War II. At the receiving end of their dictates, war-weary Poles live with the aftermath. Consequently, millions of Germans living east of the “Oder-Neisse line” are forced to leave their homes, to be treated inhumanely by their new Communist overlords. It’s obvious from the first pages of this novel that the author has done extensive research on World War II and the post-war period, creating a story both realistic and credible. Ernst and Liesel are happy to live quietly and securely in their home. The house is solid, the barn stalls occupied, the garden flourishing, and their children happy. But things have not always been so. Liesel remembers hiding from the Bolsheviks during her childhood back in 1919, and the memories terrify her. Now, a man named Hitler is determined to change the world. Ernst resists enlisting in the German army, but his resistance is suspect, especially from his brother, who is an active member of Hitler’s Nazionale Socialist Party (Nazis). When Ernst is eventually conscripted into the Wehrmacht, Liesel is left alone to care for the farm and the children. Life is difficult. Polish neighbors reject them because of their ethnicity, and their food supply dwindles. Then Liesel, pregnant and terrified, must flee with the children into the unending night of turmoil. When the tide of war shifts against Germany, the army suffers at the hands of the Russians. Ernst is listed as missing in action somewhere in Russia. Liesel is homeless and desperate. As months turn into years, they move from hope to despair, wondering if they will ever find each other again. How will the re-configuration of their home country affect their lives? Will their faith remain intact? Author Rose Seiler Scott does an exemplary job of keeping the reader in the story. Intensity is ratcheted up by character dilemmas and constantly escalating conflict. Every scene is woven into solid setting without excess description. People suffer and are forever changed. Threaten to Undo Us is skillfully shown, finely crafted. I believe this book will have a substantial impact on readers of historical fiction, as well as people whose families have gone through war and its aftermath. 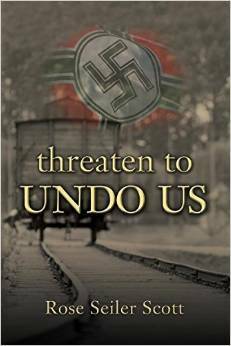 Rose Seiler Scott is the author of “Threaten to Undo Us” which is due for release May 1, 2015. She is also a contributing writer to “Hot Apple Cider with Cinnamon,” due out September. Says Rose: “I live in Surrey, BC with my husband and our two youngest who aren’t really children anymore. Until our daughter was born, I was the lone feminine voice in a crowd of loud and louder, but the older two are married, which nicely evens the male-female ratio when everyone comes to dinner. “I knew when I was about ten I wanted to be a writer, but life being what it is, I sort of forgot for a few years and did stints as a bookkeeper, piano teacher and PAC President at my kids’ school. “I never really stopped writing, if you count church newsletters, parent advisory council minutes and raving letters to the editor. But what really brought me back was the compulsion to tell a story, a complex, but compelling tale that has unfolded over the course of many years… “I am also a Christ-follower and a student of God’s Word. My Christian worldview will colour my perspective; I sincerely hope in a gracious and God-honouring sort of way. “In between writing, I like to sing, read, scrapbook, play the piano and bike ride.” For more information about Rose, check out her website at http://roseseilerscott.com.